DyGe3 or dysprosium germanide is a silver-white rare earth element that is not very often found in the Earth crust. It forms refractory oxides that are almost insoluble in water. 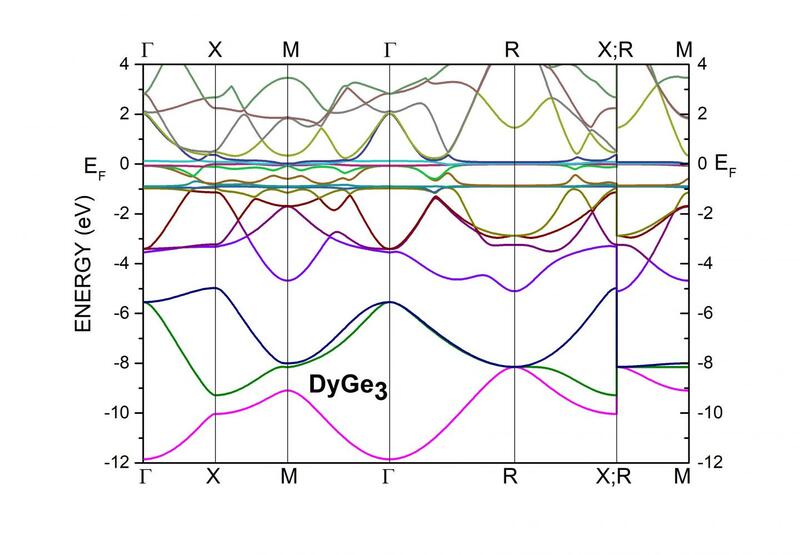 During the study the scientists applied the pressure of 8 GPa to obtain polycrystal samples of dysprosium germanide in a metastable state state of local thermodynamic equilibrium capable of changing to a more stable state under certain conditions. The physicists found a charge-density wave (CDW) in this compound – the phenomenon which occurs in some crystals at low temperatures due to the peculiarities of their electron structure. A CDW describes space-periodic modulations of ions and electron density, i.e. the oscillating space probability of finding electrons and ions along the CDW propagation. Recent studies paid much attention to the physics of CDW in rare earth compounds and how this wave influences crystal lattice distortions and magnetic ordering. Magnetic ordering implies a spontaneous alignment of vectors of atomic magnetic moments in a substance. These vectors located at atom positions can point out in different directions: they can be either parallel (ferromagnetic order) or anti-parallel (anti-ferromagnetic order) to each other. A few years ago scientists found out that a CDW can precede and co-exist with the anti-ferromagnetic order. When the temperature is lowered, CDW appears in the dysprosium germanide, followed by a transition to an anti-ferromagnetic order at still lower temperature. "We've discovered that when the crystal lattice structure is slightly distorted, the local crystal site symmetry around certain atoms changes, and the substance experiences a transition to CDW. The wave influences magnetic properties of the material, causing the appearance of a spiral magnetic structure," – pointed out Alexander Nikolaev, a co-author of the article, Doctor of Physical and Mathematical Sciences, lead researcher at the laboratory of electron-nuclear and molecular processes of SINP. According to the team, the obtained results help to understand better the mechanisms of correlations between charge and spin characteristics of electron system. The former ones are associated with CDW, and the latter – with the anti-ferromagnetic order. "Our work focuses mostly on fundamental issues of condensed-matter physics, which include magnetism and structural phase transition. In the future this work can lead to a better understanding of complex magnetism in rare earth elements and the appearance of new prospective materials," – concluded the scientist. The work was carried out in close collaboration with scientists from the Institute for High Pressure Physics (RAS), Moscow Institute of Physics and Technology and Joint Institute for Nuclear Research, Institute for Nuclear Studies and Nuclear Energy (Sofia, Bulgaria), Institute for Physics of Condensed Matter (Braunschweig, Germany), and the Institute of Physics of Maria Curie-Sklodowska University (Lublin, Poland).